A Different Stripe is Moving! Vladimir Sorokin, author of the recently published Ice Trilogy* (as well as of The Queue, also published by NYRB Classics) lives in Moscow, but this weekend, you can catch him in New York. He's participating in two events being held as part of the PEN World Voices Festival of Literature. More about Sorokin and the festival can be found here. "I crave rereading this trilogy, just as the Brotherhood of the Light long to be reunited with their Ice. It is a desire to experience something elemental, basic, and heart altering. —Mike of Third Place Books in Lake Forest Park, WA, where we fear the employees might be forming their own gnostic cult. The PEN American Center has posted audio of Paul Auster reading two poems by Kabir, translated by Arvind Krishna Mehrotra's. The poems were originally published in PEN America 11: Make Believe. We've recently collected these poems (in slightly different versions), and many others, in Songs of Kabir. Speaking of translation and the Pen American Center—don't forget that their annual world literature festival, PEN World Voices, kicks off today. tomorrow will be a mummy or ashes. Birth is scented with death. The minute you were born. You’re an old man now. Has you by the balls. You can’t be too careful. I have a prayer to make. Since we last posted about the death of L.J. Davis, a couple of more pieces about the writer have surfaced. The first appeared in The Awl under the fabulous title, "The Most Flagrantly Tactless First-Rate Brooklyn Novelist." It's by Brooklynite Evan Hughes, whose own book, Literary Brooklyn: The Writers of Brooklyn and the Story of American City Life, comes out this summer. And n+1 has reposted Elizabeth Gumport's look at the literature of gentrification, which takes Davis's Meaningful Life as a starting point. Hey, librarians. Hey, readers. Hey, Small Press! You walk into your library. You glance around the shelves filled with row after row of the same best sellers, but you're not interested. Maybe you even know the titles of a book or two you've been wanting to read. Alas, the library doesn't have them in its collection. You walk out empty-handed, or with something you're just not that into. You're in a bookstore. This book looks good. That book looks great! You reach for your wallet, but then you remember you're broke. No use checking out your library, you think, those aren't the kind of book they'd have. Tell them how much you like small press literature and why you’re excited about these particular titles. Encourage them to check out this site. There is nothing that brightens up the day of a librarian like a conversation with an enthusiastic reader. If we can't convince you to go to a library, maybe Linda Holmes at NPR can. She had an epiphany about libraries and their greatness just the other week, chronicling them hilariously on her twitter feed. "In his old age Orm used to say that this period in his life was lengthy to endure, but brief to tell of, for one day resembled another so that, in a sense, it was as though time was standing still for them. But there were signs to remind him that time was, in fact, passing; and one of these was his beard. When he first became a slave, he was the only one among them so young as to be beardless; but before long his beard began to grow, becoming redder even than his hair, and in time it grew so long that it swept the handle of his oar as he bowed himself over his stroke. Longer than that it could not grow, for the sweep of his oar curtailed its length; and of all the methods of trimming one’s beard, he would say, that was the last that he would choose." "She put her suitcase on a chair and went to the window. The sun. It came steadily through the window, making no shadows of bars. The key. It was to keep others out, not to keep her in. Whenever she wanted to, she could leave. She looked at the room, the green walls, the floor; she touched the white rough covers of her bed. Here, in this room, to stand, to move, to sleep. Here, perhaps, to live?" "One of the things—one of the many, many, many things that fascinate me about myself—is how it is possible for me to know something without really knowing it at all. I mean I seemed to have known about queers all my life, I can’t remember when I didn’t, and I generally can guess who is. I mean, it’s no traumatic shock for me or anything like that to discover that so-and-so actually is one—and yet, I swear, I was flabbergasted when I saw that club. There was a style of flirting along the bar where some sailors stood waiting to be picked up, that no starlet could hope to emulate. And the droves and droves. I had no idea there were so many. I just had no idea." "So I went. I had nothing better to do, had I, except recount my money and repaint my finger-nails and die of frustration?" "The city of Singapore was not built up gradually, the way most cities are, by a natural deposit of commerce on the banks of some river or at a traditional confluence of trade routes. It was simply invented one morning early in the nineteenth century by a man looking at a map. ‘Here,’ he said to himself, ‘is where we must have a city, half-way between India and China. This will be the great halting-place on the trade route to the Far East. Mind you, the Dutch will dislike it and Penang won’t be pleased, not to mention Malacca.’ This man’s name was Sir Thomas Stamford Raffles: before the war his bronze statue used to stand in Empress Place in a stone alcove like a scallop shell (he has been moved along now and, turned to stone, occupies a shady spot by the river). He was by no means the lantern-jawed individual you might have expected: indeed, a rather vague-looking man in a frock coat." "Only a pathological martyr would cook in such weather. The heat sizzled over the filthy streets like an invisible mustard plaster. If you fancy cooked banana peel with pizza and eggshells, there was a feast in the gutter. There were a lot of drunken bums hanging around, competing for nickels with hippies in hair-shirts, rehearsing the plague. I dragged myself to Bleecker Street, holding my unmasked breath until I was in the sheltering arms of the A&P. It was freezing in there. I asked a mustachioed clerk where the cold cuts were hidden, but naturally he didn’t speak a word of English. 'Cold cuts,' I shouted into his insane face. He laughed gleefully, as if I had proposed that we both crawl under the check-out counter and knock off a quickie." "This shooting trip of mine started, I believe, innocently enough. Like most Englishmen, I am not accustomed to enquire very deeply into motives. I dislike and disbelieve in cold-blooded planning, whether it be suggested of me or of anyone else. I remember asking myself when I packed the telescopic sight what the devil I wanted it for; but I just felt that it might come in handy." *"Seven are the days of the week." From a song traditionally sung on Passover (which begins next Monday). It is with sadness that we report the death of novelist and journalist L.J. Davis, whose A Meaningful Life we were privileged to have published in 2009. "L. J. Davis was a remarkable writer with a caustic sensibility that was very own his own. He was also a true character, scabrously funny and perfectly free of false piety. NYRB was lucky to publish his novel A Meaningful Life, one of the best books about not just New York but America in the strange decade of the 1970s, when the country lost its post-World War II optimism once and for all. I hope L.J. wrote down his wonderful and oft-told story about flooring (literally) a drunken George W. Bush. As far as I know it doesn’t make an appearance in Decision Points." "Mr. Davis was known among friends and editors as affable and voluble, a man who arrived at every personal encounter equipped with a capacious store of unusual facts and anecdotes he was prepared to dispense at the slightest provocation." "A little over a year ago, I interviewed Davis for a Forbes piece I was working on about NYRB Classics. When I first contacted him over email, he responded, “My dear fellow, this will be splendid; I will have much to say.” We made plans to meet at a little cafe near his apartment on Atlantic Avenue in Brooklyn. 'Why not ring my bell at six?,' he wrote me the day we were to meet. 'That’ll give you time to hop over here. If you’re early, ring the bell anyway; I’m not a great fan of punctuality, having been raised (as I was) by compulsive right-wing fanatics.'" "We'll miss the funny, smarter-than-you way he wrote about money and urban life." L.J. is a serious comic writer. His novels mingle Groucho Marx, a bit of Noël Coward, and some Theodore Dreiser.... I add to the mix Louis-Ferdinand Céline’s Voyage au bout de la nuit (Voyage to the End of the Night), a masterpiece of loathing. Davis is not only serious, he is stern. Life is a hard business that we need to think about. But all our thought doesn’t keep it from being outrageously grotesque, unsuccessful, ridiculous. If I may bring in another illustration, he is like a novel-writing Buster Keaton." Framed again no second smell. Thou art the only manly scent. April 8, 2011 — 3:00 p.m.
As part of Harvard Bookstore’s Friday Forum series, Thomas Teal, translator of Tove Jansson’s novels The Summer Book, The True Deceiver, and Fair Play, will speak about translating these works from the original Swedish. 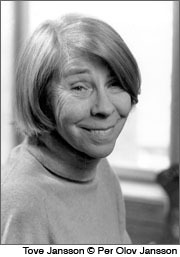 Although Tove Jansson is perhaps best known for her children's books featuring the Moomins, she also wrote a number of works for adults. Recently published by NYRB Classics, Fair Play is the first US publication of Thomas Teal's prize-winning translation. In Fair Play the art of loving, creating, and living is examined in this group of quietly moving, "discreetly radical" episodes from the lives of two artists. In one of the most bizarre casting decisions in recent memory, actress Jennifer Garner is, according to the Hollywood insider website deadline.com, to play Miss Marple in the forthcoming Disney reworking of the much-loved TV series based on Agatha Christie’s novels. I aspire to Miss Marple's persona: to be exactly as I am, decrepit nature, yet supernature in one, equally alert on the damp ground and in the turbulent air. Perhaps I don't have to wait for old age for that invisible trespass and pedestrian tread, insensible of mortality and desperately mortal.